Always know exactly where your business stands with QuickBooks. Spend less time on bookkeeping and more time running your business. Connect QuickBooks to your bank, credit cards, PayPal, Square, and other accounts and we’ll automatically import your transactions for you. QuickBooks automates standard bookkeeping tasks such as entering transactions, performing calculations, and organizing data to keep your books balanced. We’ve designed QuickBooks to move around with you. Use your phone or tablet to enter transactions, record expenses, invoice customers, send reports, and more – from anywhere. QuickBooks automatically backs up your data to the cloud and syncs across all your devices. Keep things organized in one place so you never miss a tax deduction. QuickBooks keeps records in accordance with FASB (Financial Accounting Standards Board), ensuring your books are balanced and every dollar is accounted for come tax time. You can even snap and save photos of receipts so you always have source documents handy. QuickBooks bookkeeping software for small business includes financial statements and business reports such as the profit and loss statement, the cash flow statement, and the balance sheet. Do you have colleagues or clients that ask to review specific reports on a regular basis? No problem. Easily schedule reports to be generated and emailed daily, weekly, or monthly. Using a small business bookkeeping software can help you gauge your business’ health, which can in turn help you plan for the future. QuickBooks can help you identify your most profitable customers, see which customers are regularly late paying invoices, analyze your spending habits, identify potential cost savings, and more. QuickBooks Desktop Enterprise includes powerful bookkeeping tools designed for businesses with over 20 employees. It is packed with features and functionality for your industry, plus it has 6x the capacity of other QuickBooks editions and it supports up to 1 million items and 30 users. More than bookkeeping. Run your entire business with QuickBooks. 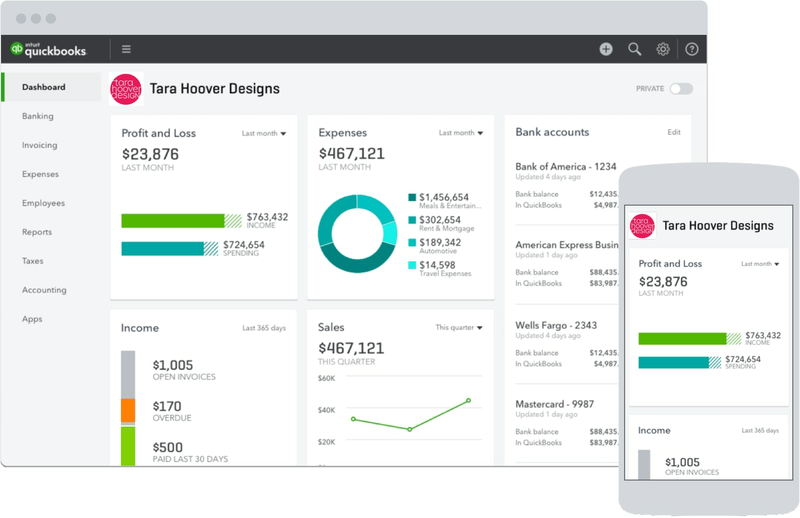 Get paid inside QuickBooks. Send customizable invoices that your customers can pay via credit or debit card, free ACH bank transfer, PayPal, Square, or others. QuickBooks processes the payment, records the transaction in your books, and deposits the money into your bank account for you. QuickBooks makes it easy to pay your bills on time so that you don’t incur late fees. Track bills inside QuickBooks – such as electricity, Internet, or cleaning bills – and schedule QuickBooks to pay them for you. The transaction will be recorded and your books will be automatically updated. Tracking expenses is easy with QuickBooks. Snap a photo of a receipt and QuickBooks will add the expense to your books for you. Easily access expense reports to see exactly how every dollar is spent. Maintaining your books is important for tax savings, audit protection, improved decision-making, and much more. Read these five significant reasons for maintaining accurate bookkeeping practices. Every small business owner should have some understanding of daily record-keeping practices and principles. Here are some of the basic small business bookkeeping principles defined in simple terms. While QuickBooks bookkeeping software makes bookkeeping tasks easy, it’s important to understand basic bookkeeping principles. Get a quick refresher on double-entry bookkeeping here. If I choose to hire a bookkeeper to help me, can I keep track of what she updates or changes inside QuickBooks? We think collaborating with an accountant or bookkeeper is important for any small business. That’s why we made it easy to create unique logins for each user. Once you create a unique login for your bookkeeper, you can review the Audit Log to see an activity history. Are there different bookkeeping practices for the self-employed? Like all other small businesses, the self-employed need to keep accurate and detailed books in order to manage their business successfully. But in contrast to employees of a company, the self employed need to estimate their income taxes and pay them quarterly to both the IRS and their state of residence (if you live in a state that has income tax). QuickBooks Self-Employed is a version of QuickBooks designed specifically to help the self-employed manage bookkeeping and taxes.